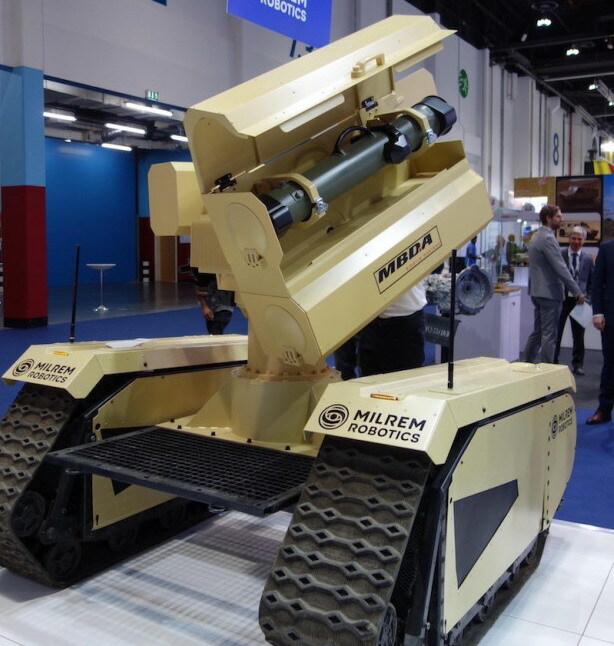 MBDA and Milrem Robotics are showcasing what they call the world’s first anti-tank unmanned ground vehicle (UGV) at the IDEX 2019 exhibition in Abu Dhabi. The debut of the system comes eight months after Milrem Robotics and MBDA announced the start of feasibility studies of the system, MBDA said on 17 February. The joint project integrates the Milrem Robotics THeMIS unmanned ground vehicle with the MBDA IMPACT (Integrated MMP Precision Attack Combat Turret) system fitted with two MMP 5th generation battlefield engagement missiles and a self-defence machine gun. “This combination of two of the most modern technologies in their field is a very good example how robotic warfare systems will bring disruption to the battlefield and make some traditional technologies obsolete,” said Kuldar Väärsi, CEO of Milrem Robotics. “Our unmanned land combat system under study together with MBDA will be very efficient in keeping our troops safe and significantly increasing the capability to fight main battle tanks as well as any other ground target,” Väärsi added. The land combat warfare system is intended to be remotely operated. Soldiers can deploy it while remaining at a safe distance and using a wireless or a tethered connection. The system will have a low heat and noise signature so it can stay unnoticed until completing its mission, MBDA said. “Being delivered to the French Army since the end of 2017, the MMP system is now deployed by the French forces in theatre, where it replaces the Milan and Javelin missiles. With fully digitalized functions of observation, targeting, positioning and guidance, the MMP system is perfectly suited for integration on vehicles, including remotely operated ones,” said Francis Bordachar, Military Advisor Land Products at MBDA. Milrem Robotics is an Estonian defence solutions provider whose primary focus is the manufacture of unmanned ground vehicles, development of robotic warfare solutions and performing concept of operations and doctrine level warfare analysis. Its THeMIS UGV is a fully modular diesel-electric unmanned ground vehicle that can operate up to 10 hours with a full tank, including up to 1.5 hours in silent mode. It has a top speed of 22 km/h and can carry a payload of 750 kg. It can be operated line of sight, via cameras or equipped with an autonomy kit for fully autonomous operation. IMPACT is a 250 kg motorised turret designed for light armoured vehicles. IMPACT carries the day/night sensors of the MMP fire control, as well as two ready-to-fire missiles and a 7.62 mm self-protection machine gun and its ammunition. The firing installation commands are displayed remotely in the vehicle cab so that the crew remains safe from enemy fire and adverse weather conditions thereby increasing permanency in combat.